A young golden eagle tagged in Scotland last summer is thought to have been killed just seven miles from the Scottish Parliament, and its body dumped in the North Sea. The eagle, named Fred, hatched at a nest site in the Scottish Borders in 2017, and was the offspring of the only breeding pair in the region. Named after the landowner’s grandson,Fred was satellite-tagged in June in a project involving TV presenter and naturalist Chris Packham and Dr Ruth Tingay of Raptor Persecution UK, designed to follow the birds’ movements. It was hoped that the protected raptor would go on to increase the vulnerable breeding population in the Borders, but it disappeared last month in highly suspicious circumstances in the Pentland Hills, just seven miles from the Parliament building in Edinburgh. Its tag “suddenly and inexplicably stopped” on January 21, only to resume transmissions three days later when the raptor’s GPS location was shown to be in the North Sea, ten miles offshore from St. Andrews in Fife. Campaigner Packham described the loss so close to the seat of Scottish government as “shocking” and expressed fears for the reintroduction of the species to the south of Scotland. He said: “Once again, we have the suspicious disappearance of a satellite-tagged golden eagle in an area managed for driven grouse shooting. 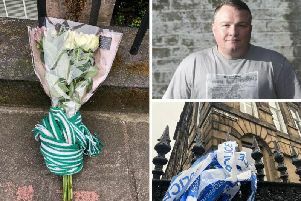 “What’s truly shocking about this case is that it didn’t take place in a remote Highland glen miles from anywhere, but it happened within a stone’s throw of Edinburgh, right under the noses of the Scottish Government. “What must the good people of Edinburgh think, to learn that golden eagles aren’t even safe on their doorstep? That they’ve been denied the opportunity to see this iconic, magnificent bird in their local hills? Data from Fred’s tag showed it had stayed close to its nest for several months after fledging before making its first exploratory flight outwith within its parents’ territory in mid-January. It spent a few days “woodland hopping” around the northern edge of the Pentlands -- at one point just half a kilometre from the City Bypass -- during which researchers were provided with accurate and frequent GPS locations via the working tag. On January 20, Fred roosted overnight in a shelter belt overlooking a grouse moor near Balerno. His tag continued to record his position there until just before 10am on January 21, when its tag ceased transmissions. On the evening of January 24, Fred’s tag began transmitting again but the GPS location showed it was in the North Sea, some ten miles offshore from St. Andrews in Fife. The tag continued to provide GPS data until January 26, showing the raptor’s final position approximately 15 miles offshore. No further data have been received. Dr Tingay said: “It is beyond doubt that Fred’s disappearance is highly suspicious. Golden eagles don’t generally fly out for miles over large bodies of sea water but even if Fred had done so, apart from defying everything we’ve learned about Scottish golden eagle behaviour, we would have seen excellent tracking data plotting his route given the reliability of his tag. “While we will probably never know for sure, it seems likely that Fred was killed soon after 10am on 21 January, his tag was hidden to suppress the signal and then he and the tag were dumped in the North Sea. “If this is indeed the case, it’s just the latest example of when those who have killed a protected bird of prey have tried to cover up evidence of their crime”. Last year a Scottish Government-commissioned report showed that 41 of 131 satellite-tagged golden eagles had disappeared (presumed dead) in suspicious circumstances in Scotland, predominantly on or near to some driven grouse moors. In response to the report’s findings, Environment Cabinet Secretary Roseanna Cunningham ordered a review of grouse moor management practices with a view to introducing a licensing scheme for game-shooting estates. Anyone with information about Fred’s disappearance is urged to contact Police Scotland on 101.